Adopt, help to save a life. They deserve the second chance. Kindness is the international language. For it can be read by the blind, heard by the deaf, and spoken by the mute. Hey fellow bread-lovers! Yup, I'm back with yet another bread recipe, and this time you can get soft and fluffy bread with minimal kneading. Yes, MINIMAL kneading. NO WINDOWPANE STAGE REQUIRED! And the method of making the dough is like a one-bowl yudane method, coupled with high hydration level, to give you soft and fluffy bread without an extreme arm's workout. Sounds super easy, right? Let's go! 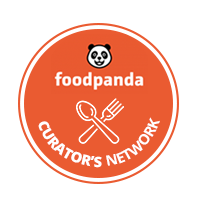 The idea of this delicious tang yuan bread comes from super talented youtube-baker Tears of Happiness. If you haven't heard of her, you should totally check out her videos (it's all in Mandarin, though). First up, in a large bowl, add in the flour, salt and sugar, and give it a quick stir. Then, pour in the HOT (make sure it's BOILING HOT, just like making your yudane dough) water and stir it around with a spoon or chopsticks. Part of the dry flour will start clumping together to form bits of "yudane dough". Set the bowl aside and for the hot dough bits to cool down. In a small bowl, pour in the lukewarm whole milk and add in the yeast and give it a quick stir to mix well and set aside. Then, crack in an egg into the flour/dough bits mixture and pour in the milk-yeast mixture. Mix well with a spoon or chopsticks until fully combined. At this point, the dough will be extremely, extremely wet and mushy. If you attempt to tear off bits of the dough, it will just break off without any form of resistance. Cover the bowl with some clingwrap and set aside at room temperature for around 20 to 30 minutes. This allows the gluten to form on its own. After 20 to 30 minutes, you can check the dough by pulling at a corner of the dough ball, it should start to stretch well for gluten has developed. Then, add in 1.5 tsp of oil and start kneading the dough in the bowl. DO NOT knead the dough on a counter as it will be super sticky and nearly impossible to work with. Due to the addition of oil, hand-kneading of the dough will start off as being rather easy as the dough will not tend to stick to your hands. But after just a few minutes of working with the dough, the oil will be fully absorbed by the dough and it will start to be extremely sticky to both your hands and the bowl. Continue kneading the dough by a "folding" method instead. Pulling out the dough from a corner and tucking it back into the centre of the dough ball. Knead the dough for around 10 to 15 minutes until you are able to roughly tuck it into a ball shape. Then, wrap the bowl with clingwrap and leave it at a warm place for 1st proofing for about 1 hour. 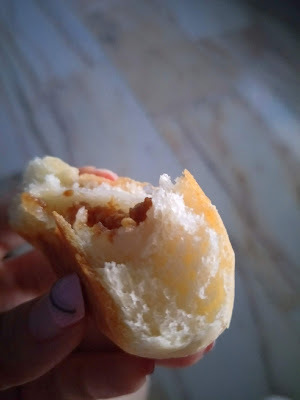 After 1 hour, check for completion of the 1st proofing by coating your finger generously with flour and poking it right down the centre of the dough ball. The hole should remain as it is with very minimal rebound. Then, sprinkle a generous amount of flour over the top of the dough ball and coat your hands with more flour and punch down the dough to deflate it. Knead it slightly until all the air bubbles has been deflated before overturning it out onto a well floured work surface. The dough will still be very sticky, so do make sure that your work surface is well dusted with flour. With flour-dusted hands, shape the dough ball into a log and cut it into 10 equal pieces and fold each piece roughly into a ball (you probably won't be able to make the dough into round balls by the traditional surface-rolling method as it'll stick) and cover with a clingwrap to prevent drying. 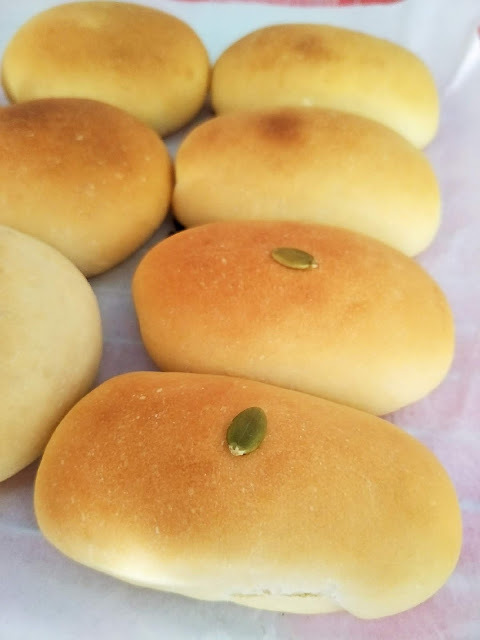 Taking a piece of the dough ball, you can either roll it out slightly with a well-floured rolling pin, or simply flatten and stretch it out using your hands, as the dough is VERY soft, it will be very easy to flatten and stretch out. Then, take a piece of the defrosted tangyuan and wrap it into the dough ball. Pinch at the seams to seal properly and roll it around in between your hands to ensure roundness of the bun and set it on a baking tray lined with parchment paper, seam side down. 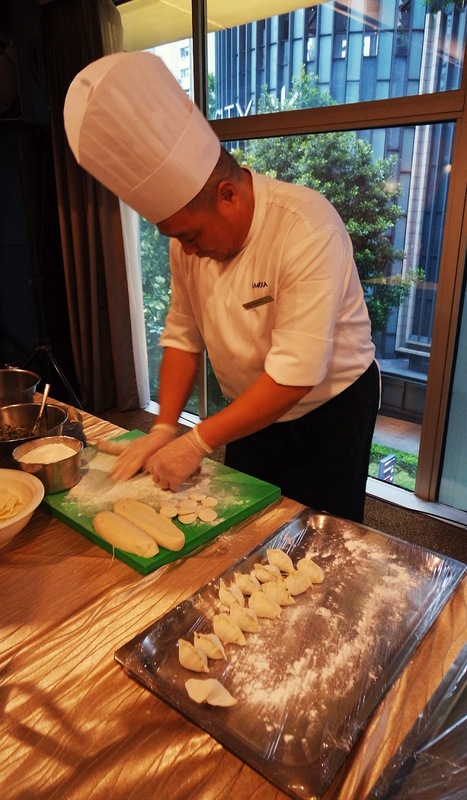 Repeat with the remaining 9 dough balls/tang yuan to get a total of 10 buns. If your oven has a proofing function, proof your buns in the oven for around 20 to 25 minutes, until the buns grow around 1.5 to 2x in size. If your oven does not have a proofing function, you can either 2nd proof the buns at room temperature for a longer time (around 45 minutes), or save a bit more time by placing a bowl of hot water under your baking tray in a closed oven. Check for completion of the 2nd proofing by coating your fingertip with some flour and lightly press down on the side of the bun. If a slight indentation is left behind with a little bit of rebounding back, the buns are ready to be baked! Pre-heat your oven to 175 degree Celsius and bake the buns for around 15 to 18 minutes, until the surface turns a light golden brown and when you tap the surface with your fingernails, it produce a hollow sound. 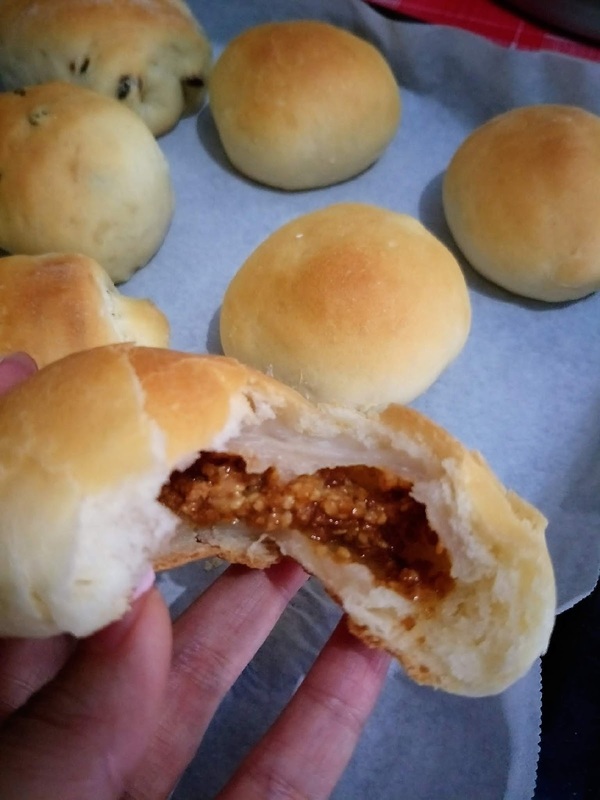 I was expecting the filling to be more runny, like Liu Sha Bao, but they turned out pretty dry. These buns are best eaten when still warm, when the peanut filling are still moist, the mochi soft and chewy and the bread super soft and fluffy. Only a 10 minutes easy kneading required, no windowpane stage achieved, and using just plain flour. And then one fine day, I decided just to test my own endurance and see if I can manage hand-kneading my bread dough from scratch, so here it is! The recipe is simple, just very basic milk bread with about 1 tbsp filling of your choice. I decided to make a variety of fillings with nutella, lemon curd and raisins! In a large bowl, add in your flour, sugar, salt and yeast, making sure that the yeast and salt are not in direct contact with each other. Then, add in 160ml of milk and stir with a pair of chopsticks or wooden spoon until the wet and dry ingredients starts to come together to form crumbly dough bits before going in with your hands to start kneading the dough in the bowl. 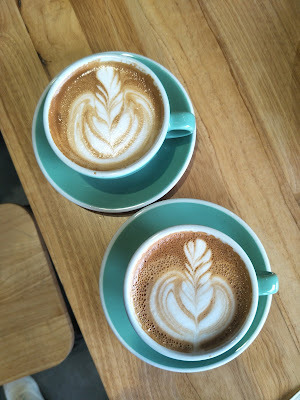 At this point, you may either add more milk or flour depending on the hydration level of your flour and continue kneading until the dough pulls away from the bowl, coming together into a ball and your hands are relatively clean of sticky dough bits. Then, take your dough ball out and flatten it onto a clean work surface. Add in the soften butter and first fold the dough over the butter for a few times before started to knead it with your hands again. This time, be prepared to really work the dough out and knead for at least 30 minutes in order to reach the windowpane stage. I kneaded my dough for 45 minutes. And if you have no idea what windowpane stage means, it means you have to pull off a small piece of the dough and stretch it out with your hands. It should be able to be stretched till extremely thin, losing its opacity, and should you puncture a hold in the dough, the edges of the hole should be smooth, free of jagged edges. Fold the edges of the dough ball down its centre to form the dough into a round ball with smooth outer surface and leave it in a clean, oiled bowl and cover with some cling wrap. Leave the dough overnight in the fridge for 1st proofing, for at least 6 to 8 hours. The next morning, take your dough out of the fridge and leave it standing on the counter for at least 30 to 45 minutes for it to rise back up to room temperature. Check if the 1st proofing is done by poking a finger right down the middle of the dough ball, the hole should stay as it is (with slight rebounding at most) and the dough ball shouldn't collapse. Then, turn the dough ball out onto a lightly floured surface and give it a few kneads to knock out all the air bubbles within. Using a bench scraper or just twisting with your bare hands, divide the dough ball into 8 equal pieces, rolling each piece into a small ball shape and setting them aside, covered with a layer of cling wrap to prevent drying. Then, take out a piece of the dough ball and roll it out slightly with a small rolling pin. You should roll it in a way such that it's thinner at the outer rim and slightly thicker in the centre. Then, add a dollop (about 1 tbsp or slightly less) of nutella, lemon curd or any type of filling you fancy (I will not suggest watery jam though, they will cause the buns to burst open) onto the centre and wrap it up into a ball by first folding the outer edges in and pinching the seam close. 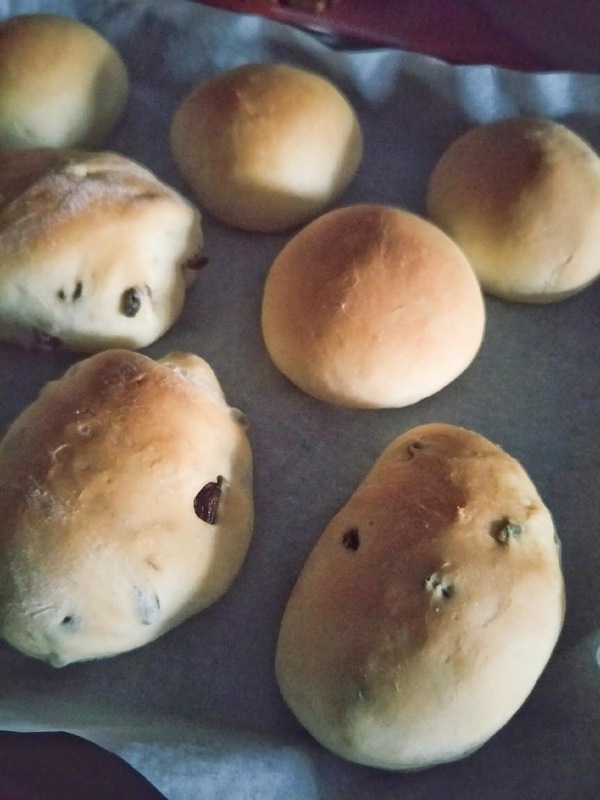 Flip the bun over, seam side down, on a baking sheet lined with parchment paper and move on to the rest of the dough balls. 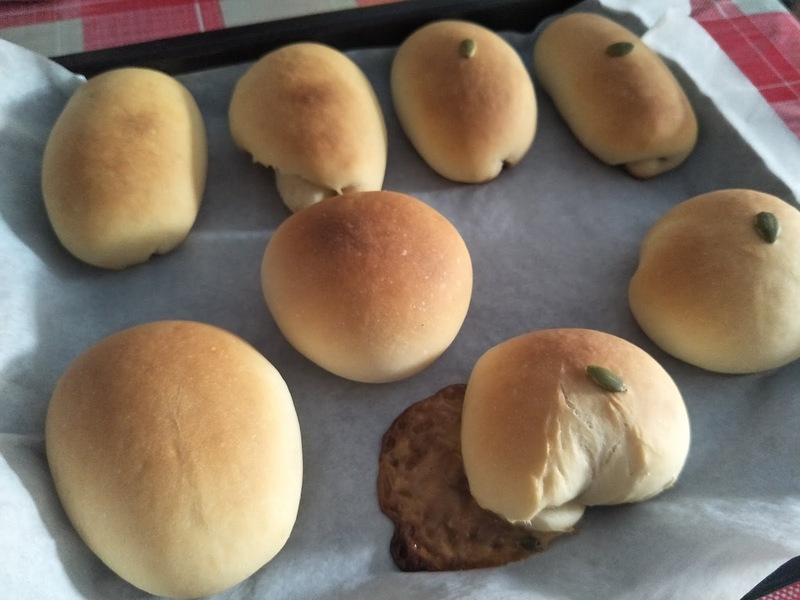 If your oven has a proofing function, set the stuffed buns to rise in your oven at about 38 to 40 degree celsius for about 20 to 25 minutes, until the buns has expanded to 1.5x the original size. You can check for completion of the 2nd proofing by coating the tip of your finger with some flour and tapping it lightly on the bun. The depression should just bounce back very slightly, and still remains visible. If your oven do not have a proofing function, you can either leave the buns to proof at room temperature for about 1 hour, or create your own "proofing function" in your oven by placing your buns on the top rack and a dish of hot water on the lower rack. When the buns are proofed, take them out from the oven and set your oven temperature to 175 degree Celsius. Once pre-heated, let your buns bake for 20 to 25 minutes. 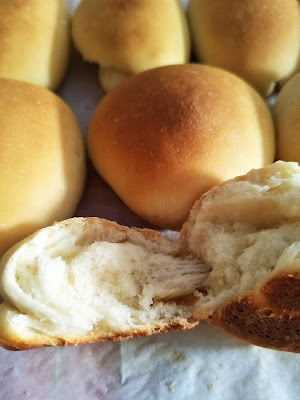 Check for doneness of the buns by tapping on the bun surface, if it sounds hollow, it's done baking. These buns are crusty on the outside, but super soft and fluffy on the inside! The only problem is that they are best eaten on day 1, for the lose the freshness very quickly. Or perhaps, I just need a better method of keeping them. And if you're also filling your bread with lemon curd, please double, triple check that your seams are well pinched. Lemon curd is quite "jam-ish" and they do explode out from the buns much easier compared to nutella. 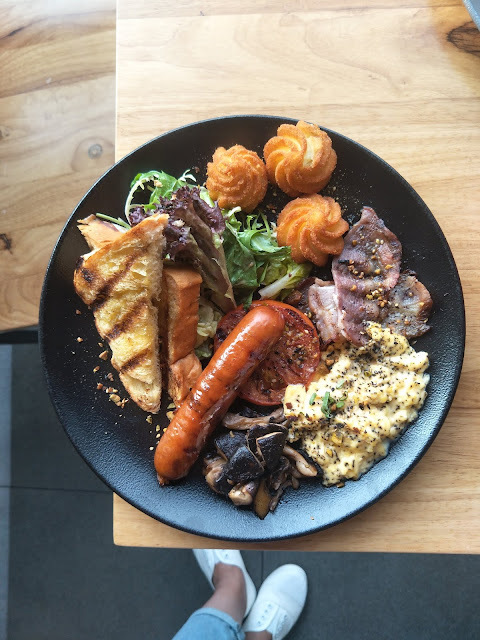 Located at the first level of an industrial building near SingPost Centre, Nuevo is an unassuming cafe set up by KitchenHub, a commercial kitchen equipment specialist, in April 2016 right next to their showroom in Eunos Avenue 3 with the intention to create and celebrate casual hearty food to share with the masses. We were there at a rather off-peak time of 4pm (to 6pm) and the cafe was still pretty packed! They very humbly attributed the crowd to the church located in the same building, but I later found out that it's really the quality of their food that counts. 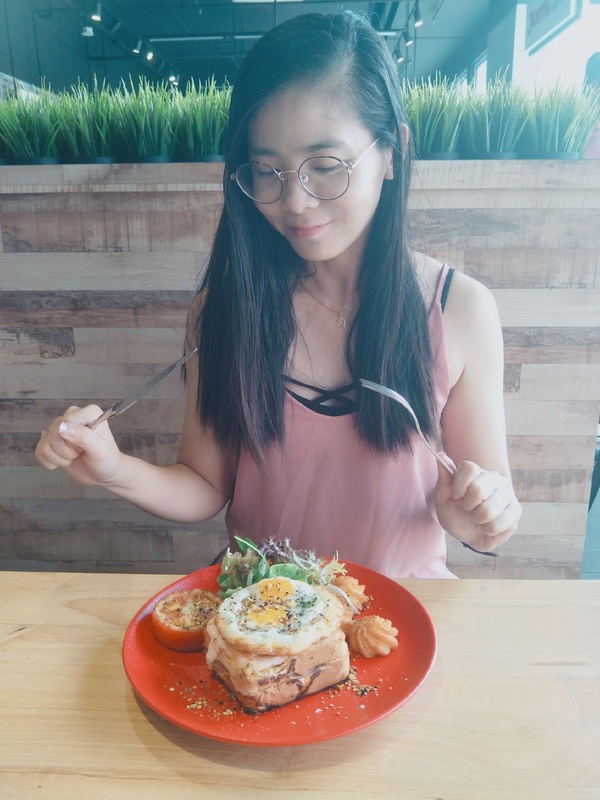 For a casual cafe establishment, Nuevo boasts a pretty impressive menu at extremely affordable pricing, and with a variety of food selections that differs slightly for weekdays and weekend. Their kitchen is located away from the cafe seating, right at the other end across the showroom. And over here, you can find the legendary acclaimed Josper Oven Grill. An oven and charcoal grill combined into one, Josper Grill simplifies the usual two step process of grilling our meat before finishing them off in the oven into one. 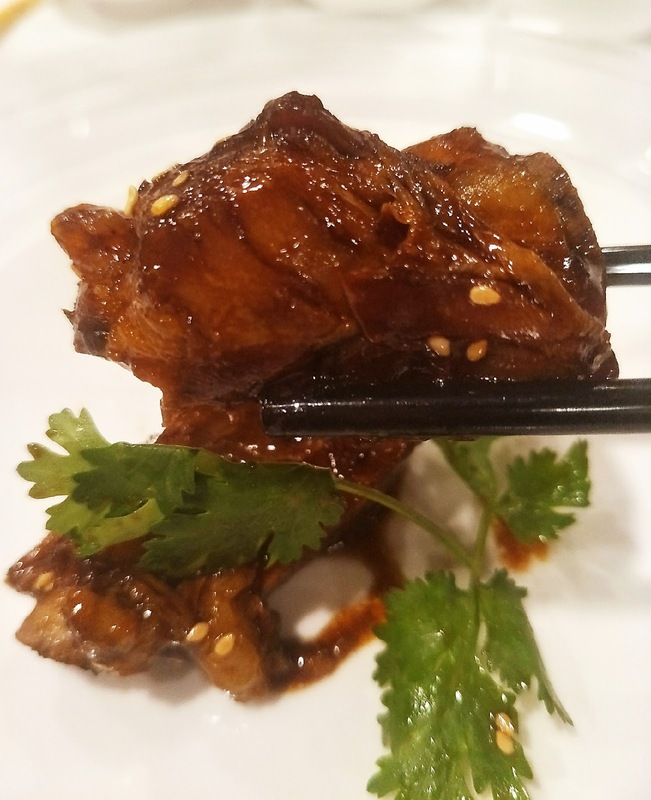 This supposedly not only shorten the time taken for thick cuts of meat to be cooked, but also create wonderfully cooked meat that's tender and succulent on the inside. And here's the main highlight of the day, FOOD! Oh, glorious food! Nuevo Cafe has prepared a selection of their newly launched menu and signature dishes from both the weekday and weekend menu for the day. A rather impressive spread, eh? But thank goodness Nuevo has very thoughtfully portioned out the dishes into food-tasting friendly serving sizes so that none of our stomachs burst that day. But before that let's touch on their signature drink, the Iced Earl Grey Tea. Sweetened with honey instead of table sugar, the ice cubes that they've used for the drink are actually frozen cubes of the earl grey tea itself, hence you will never have the disappointing moment of realising that your tea has turned into plain water when all the ice cubes has melted after being left on the table for too long. One brownie point for the effort! 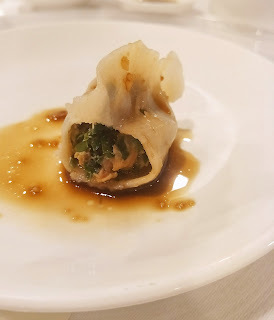 And here's some of the dishes we've tried for the day that made a lasting impression on me. I friggin' love this appetizer, OMG. These are so good! Nuevo has simply taken 3 of my favourite food, potato, mochi and cheese and mashed them together into this delicious golden nugget that's deep fried till crispy on the outside but soft, gooey-chewy on the inside and bursting with oozing Camembert cheese. As a serious carb-monster, I could actually see myself ordering two servings of this and having them as my main, I'm not joking. 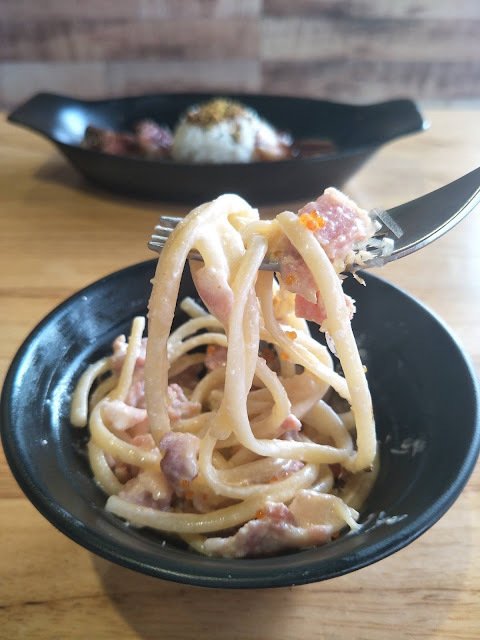 This is like an upgraded carbonara, packed full of flavour not only from mentaiko, but the addition of bacon, parmesan and tobikko also added a lot more savoury flavour to the pasta. Might be on the too-salty side if you always prefer a milder flavour. I mean, when you see bacon, tobikko and parmesan together, you should know the savoury factor is going to pack a punch. I'm hardly a fan of pork, much less to say pork belly (hate the fats!) unless it's roasted and with crackling skin but this kakuni pork is so good! It didn't even taste like pork, to be honest. The meat was so tender and juicy, it was almost like the fats and lean meat layers has been cooked to melt into each other. 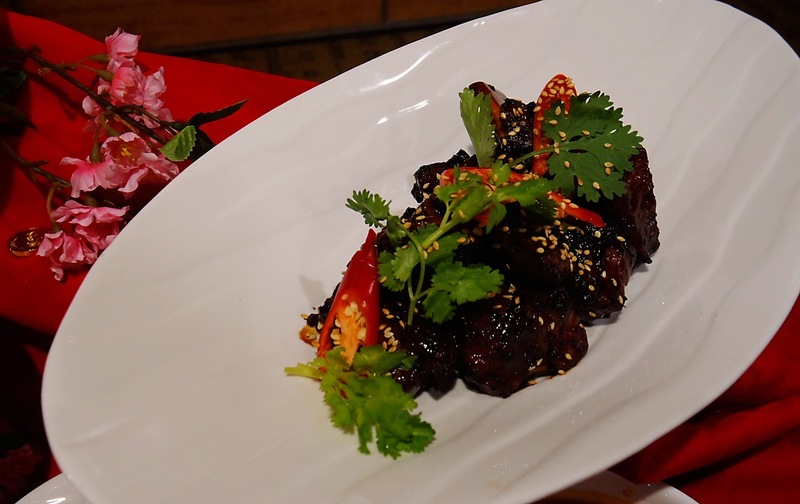 The braising sauce also gave the pork so much flavour, you could really call this addictive. There's absolutely nothing to dislike about the pearl rice, which obviously tasted premium (yes, after working p/t in both Edo sushi & Genki sushi during my university years, I've learnt that not all Japanese pearl rice are made the same...), but I did have some tiny issue with the pistachio furikake, which had some really tough-crunchy bits here and there that hurt my sensitive teeth. But it's not you, it's me. I just need to take better care of my poor, weak teeth. If you're still not sold for the kakuni pork and prefer beef, Nuevo also has a yakiniku wagyu rice bowl to satisfy your tastebuds. Look at how pink and juicy the wagyu slices are, they're literally glistening. Though tasty, I personally felt that the baked salmon was a tad dry but it could be due to the chef cutting the fish into smaller portions before cooking the fish, instead of cooking the fish as per usual serving size before cutting it up into smaller portions. But what's truly intriguing for this dish was the mashed (purple) sweet potato! Although I personally do love sweet potatoes, but the purple ones are always my least favourite as they always have this distinctive earthy soil taste. But Nuevo has not only managed to get rid of that unpleasant earthy taste, but made it taste exactly like a normal mashed potato, the usual rich and creamy texture and all. What magic is this?! 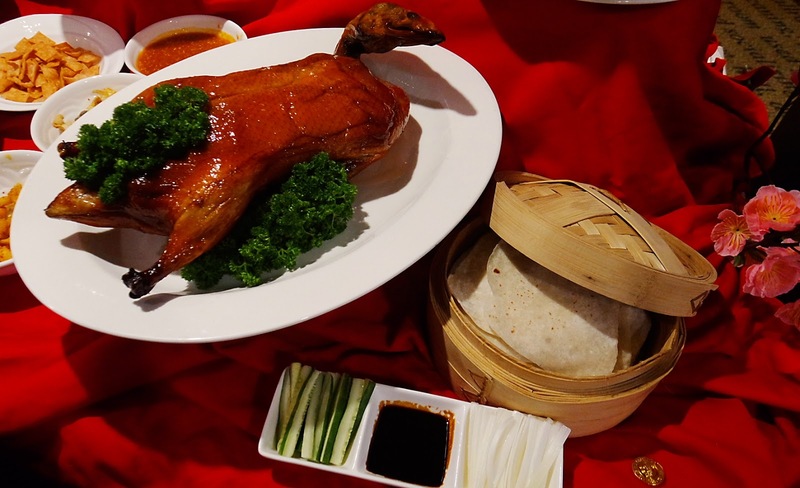 Taste wise, it is pretty standard, a savoury marinate with hint of sweetness from the honey glaze. But despite being "burnt", the insides of the meat remains extremely tender and succulent while the charred bits on the outside added a lot more depth to the flavour. Oh man, thank you, Josper Grill. And now, to their weekend brunch menu! 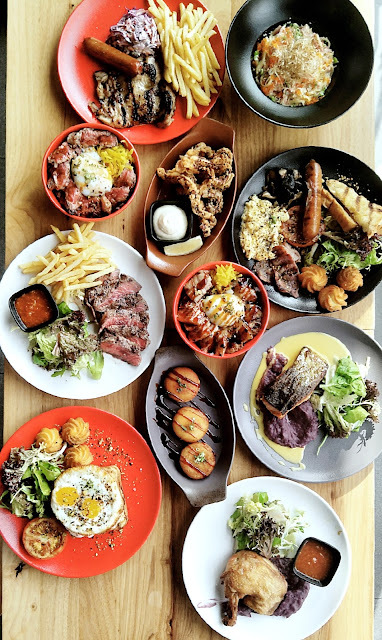 A huge, hearty platter of all things yummy, this is definitely the go-to choice for the starving. You can't go wrong with brioche, juicy cheese sausage, bacon and creamy scrambled eggs together on a plate. Having it looking so instagram-worthy just adds more brownie points to it. 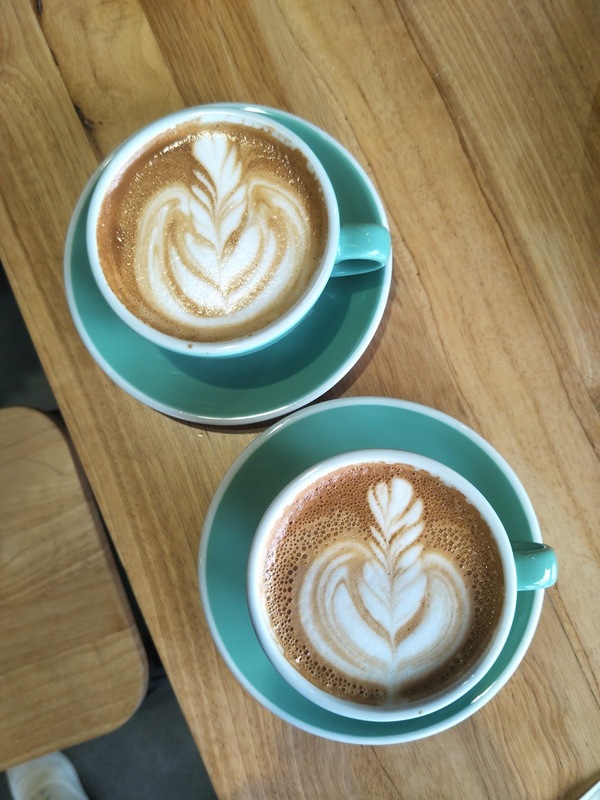 For fellow coffee addicts out there, you'll be glad to know that Nuevo does a pretty decent Flat White too! But those funky looking bubbles on the surface was due to me leaving it standing on the table for a little too long. Heh! Wow, it's been quite a while, people! I know I should be continuing with my New Zealand travelogue, but it's really hard trying to organise the thousand over photographs taken with 3+1 devices. Just... give it a little more time, yeah? Well, frankly speaking I've been baking a lot less too. I've been a little bit busy with some other commitment, and perhaps I will blog about that in time to come. But let's get back to baking, shall we? This time, it's a really simple "two-bowls" recipe by mashing up two extremely no-brainer one-bowl recipes together. Let's get over the ingredients so we can get started! In a clean bowl, beat the soften cream cheese with sugar until well combined. Add in the egg and mix further until smooth and set aside. In another clean bowl, pour in the brownie mix along with egg, strong coffee and melted butter and mix until just combined. Throw in the chocolate chips and give it a couple of folds to distribute it evenly in the batter. Line your 8x8 baking pan with baking paper and spray it down with some cooking spray so nothing sticks. Pour in the brownie batter and even it out with a spatula. Then, using a spoon, drop dollops of the cheesecake batter on top of the brownie batter. 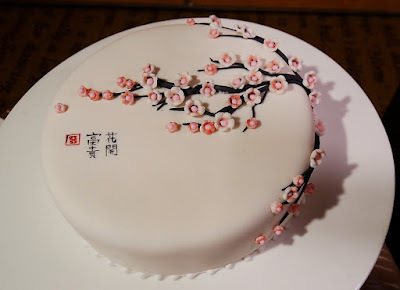 With a chopstick, give the mixture a few swirls to marble up the two batters. Tap the pan on the counter to even out the surface. You may add a bit more chocolate chips on top of the cheesecake batter if you fancy. 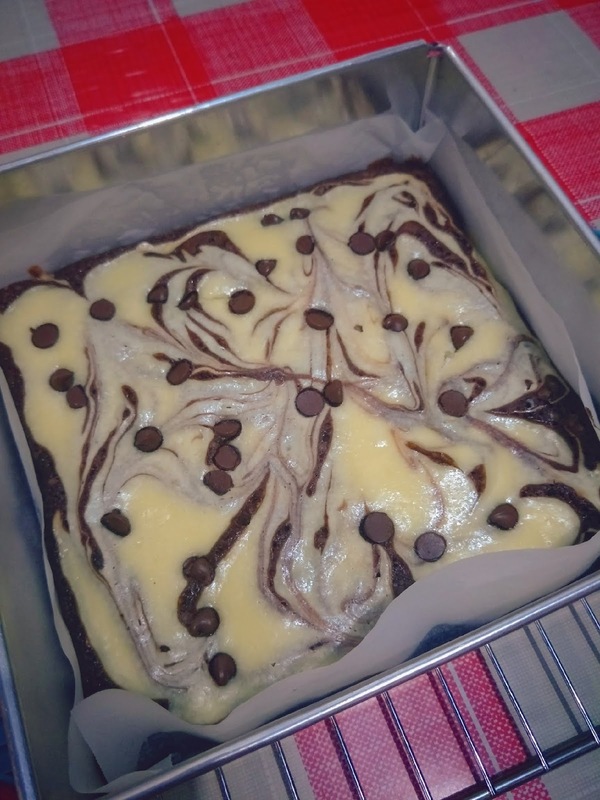 Send the cheesecake brownie to bake in the oven that's pre-heated to 175 degree Celsius for about 25 minutes. You may want to start checking for the doneness with a toothpick at 20 minutes, especially if you want your brownie to be fudgey instead of being cakey. If a fudgey brownie is what you're looking for, your toothpick should have a few wet crumbs on it. At this point, also check for the doneness of the cheesecake by lightly pressing down on the surface to make sure that it has "set". Take the pan out of the oven and wait for it to cool down slightly for around 10 minutes before attempting to lift the entire brownie out of the pan. Then, leave it on a wire rack to cool COMPLETELY before cutting into it. If you would love a more marbled looking effect, I suggest you can alternate the brownie and cheesecake batter layers into 4 layers such that you can get some cheesecake right in the middle of the brownie layer as well. I know, Betty Crocker brownie mix isn't the best tasting ones you can find, but by switching up the water and oil with strong coffee and melted butter, along with a handful of chocolate chips really do make a difference. 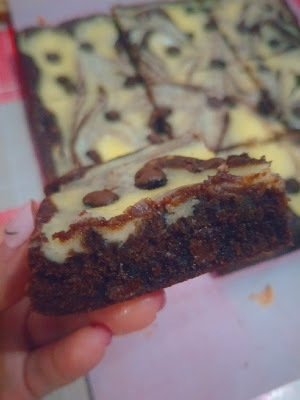 The coffee brought out the richness of the chocolate and the (browned) butter added a lot more decadent flavour to the brownie. With Chinese New Year around the corner, are you still looking for a place to have your reunion dinner? 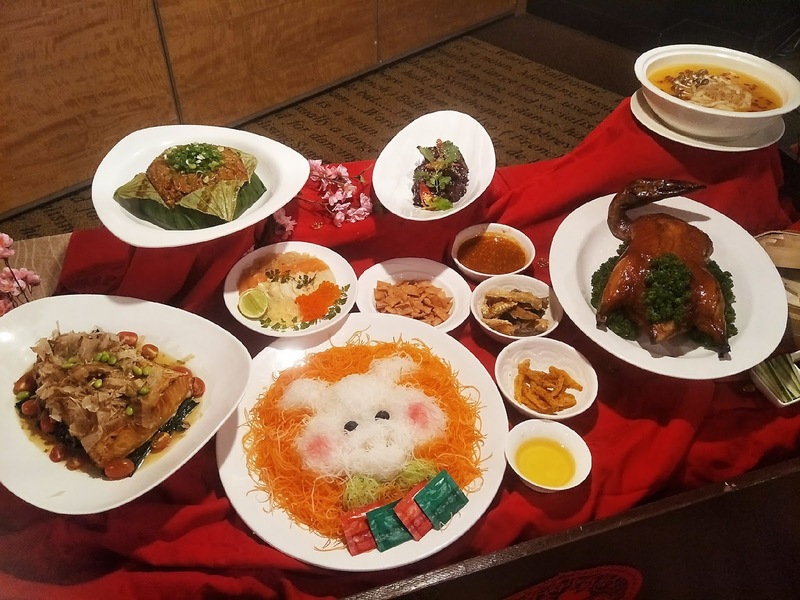 With awesome packages ranging from $68 to $138 per pax for both CNY Reunion Dinner on 4th February and CNY Set Menus running from 21st January to 19th February, you can usher in the year of the Pig in style with Silk Road Amara Singapore! And here's a few dishes you can expect from their 2019 CNY Reunion Dinner & set menus! This definitely earned ALOT of oohs and aahs for the night. Isn't it cute to have the sliced veggies in the form of a cute little piggie? 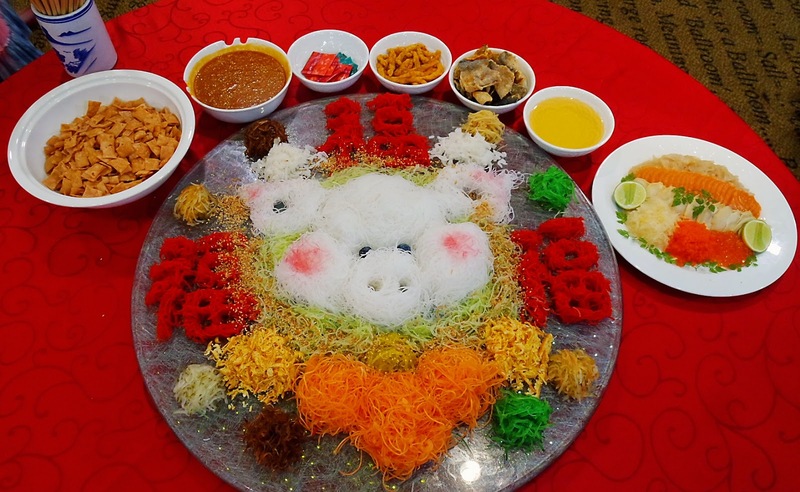 The yu sheng set comes with salmon, and you can also get additional toppings of both salmon, abalone and also crispy fish skin to add more dimension to the taste and texture of your yu sheng. 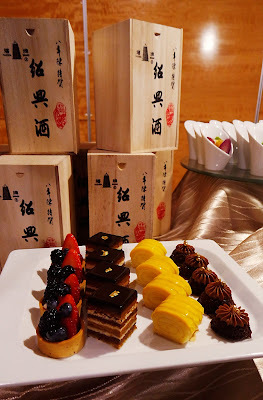 Also included in the yu sheng set are jellyfish, ikura (salmon roe) and tobikko (flying fish roe) and Amara Hotel's special housemade Spicy Sze Chuan dressing, which gave the yu sheng a rather unique, mildly spicy & savoury aftertaste. 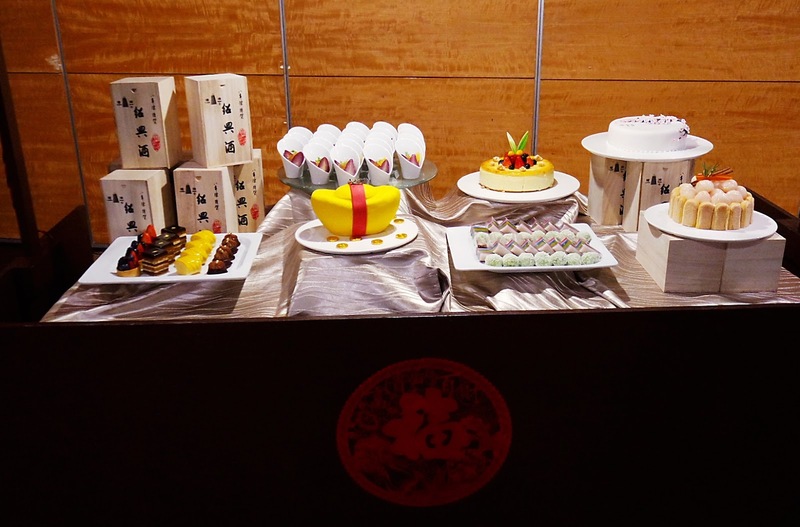 Before dinner was served, we were all mingling around in the ballroom, getting excited over the pretty cakes at the dessert buffet table and also getting awed by watching the chef hand-making some dumplings, which is one of the lucky food to eat during CNY for it signifies wealth. Love these dumplings, for the skin isn't too thick and doughy nor too thin and flimsy. 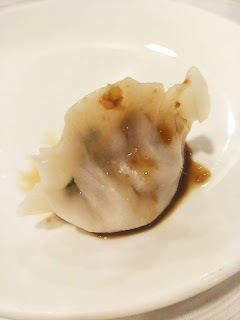 Every bite is a good ratio of the dumpling skin to flavourful filling, and of course the special dumpling sauce that tasted remotely like some garlic soy sauce vinaigrette added a beautiful final touch to the dish. Frankly speaking, I'm hardly a beijing roast duck person as I typically do not eat skins. GIVE ME MEAT, PLEASE! >.<"
Pardon my messy eating, but I just have to show off the meat! Unlike some other Beijing Roast Duck I've tried elsewhere, the chef at Amara Hotel has very generously sliced off a good amount of the meat along with the skin, which added a lot more flavour and texture to the rolls. Isn't this so pretty? It looks like a pot of gold! 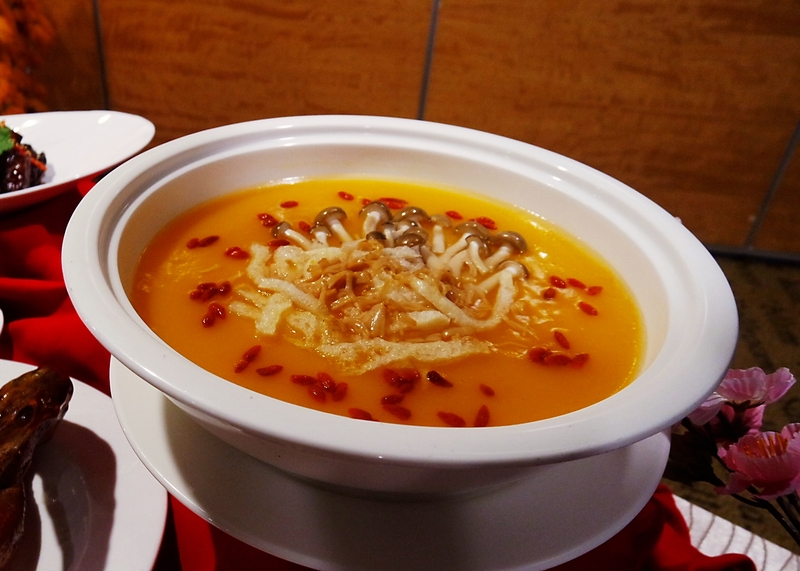 This soup is like a unique blend of east meets west, a rather rich and creamy thick pumpkin soup base (almost like cream of pumpkin) served chinese style with a generous serving of ingredients like mushrooms, dried scallop and fish maw. 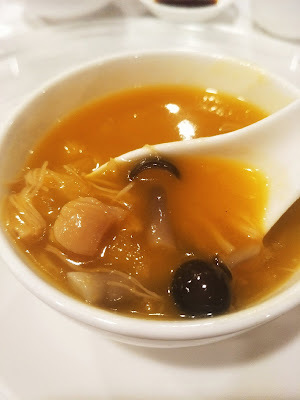 A very satiating soup to start the meal indeed, with a well balanced flavour of the pumpkin sweetness with the distinctive savoury taste of fish maw and dried scallops. I shan't deny that I'm hardly a fan of pork in general, and absolutely dislike is exceptionally sensitive to the very distinctive pork smell. 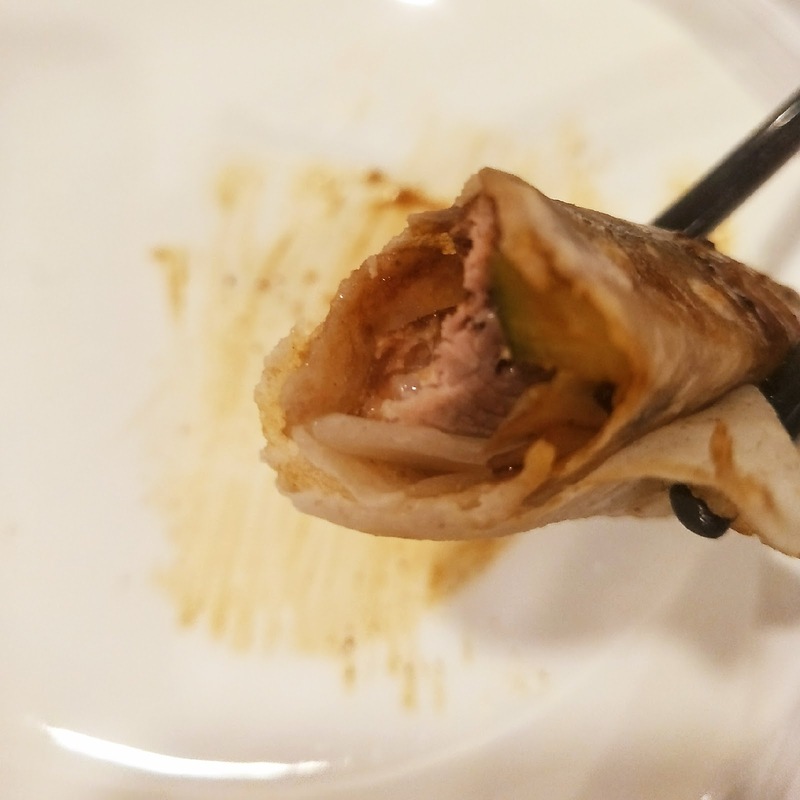 The slightly sweet braising sauce has hardly any alcoholic taste (so even if you absolutely cannot take beer, do not worry about it), and is rather pleasing on my tastebuds, but unfortunately it failed to mask the strong pork smell from the pork ribs. The meat is also a little more on the chewy side and definitely not the literally falling off the bones kind of tender. I know, if you're a pork lover, you will be scratching your heads right now and wondering, what's wrong with pork having pork smell? So I can't only say, sorry pork ribs, it's not you, it's me. Can some fish expert tell me what's the local name for Sea Perch? And I'm elated to find not just spinach, but edamame (my love) and cherry tomatoes in my Sea Perch! 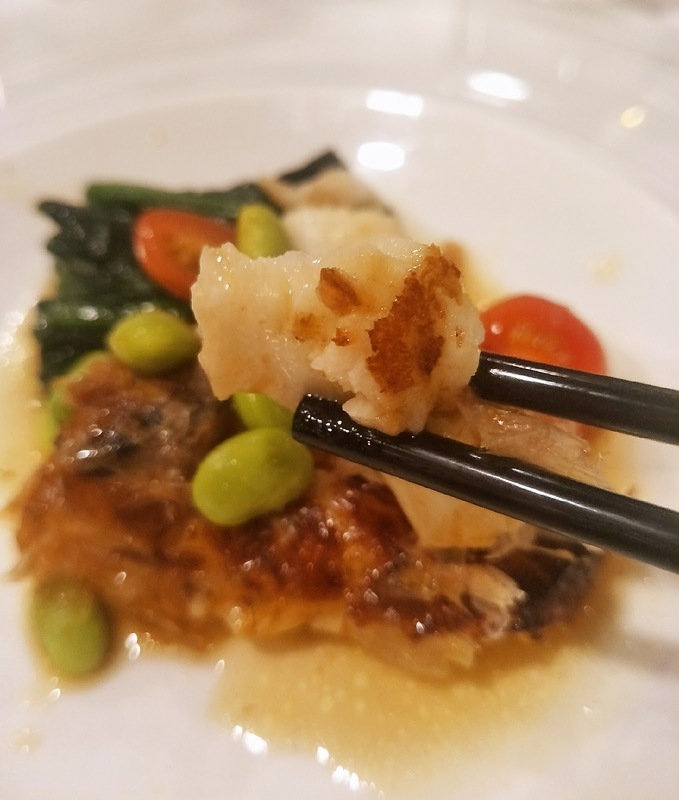 Tasting almost exactly like Codfish, but less of the rich and heavy oily-fatty taste, the Sea Perch was definitely one of the most loved dish at the table. 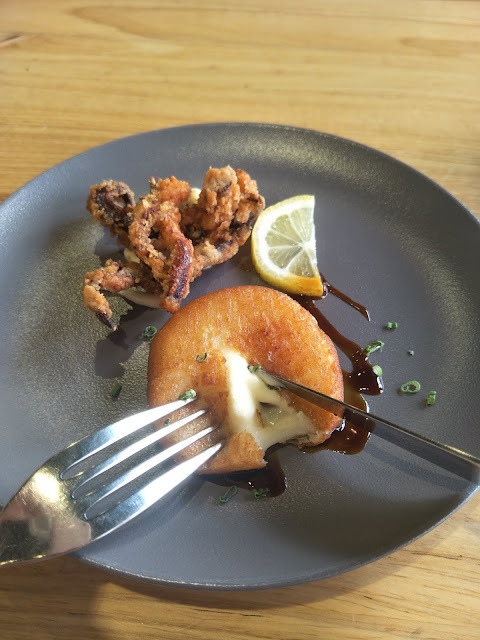 With an exceptionally tender, melt-in-your-mouth texture and paired with the savoury bonito sauce, I could probably eat the entire fish if we weren't being served single portions. I'm a huge fan of lotus leaf rice in general, but always prefer mine with a more peppery and savoury taste. With a rather generous serving of chinese sausage (lap cheong), the rice tasted a lot more sweeter than I would have enjoyed in a lotus leaf rice. 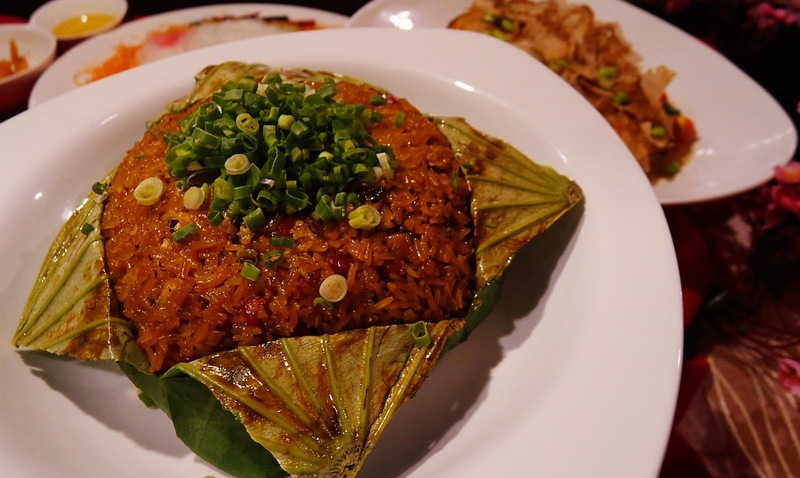 But no doubt, this will be a good choice if you're a fan of a sweeter tasting lotus leaf rice. And now, over to the dessert buffet table! 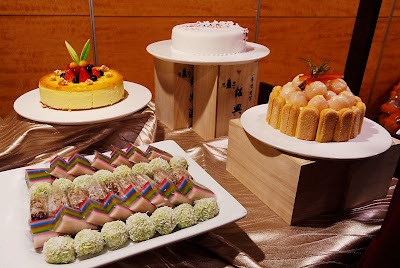 This section is totally a lady's heaven, packed full of exquisitely crafted pretty looking dessert that also aced the taste factor. This tasted rather like a tiramisu, but with a lychee twist. 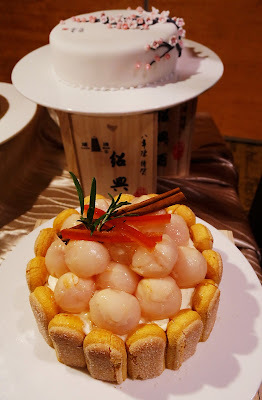 Overall a rather mild and not so sweet kind of cake, it's refreshing to find that the addition of lychee helps to cut down the surfeiting (jerlak-ness) richness of the cheese-cream. If I didn't tell you it's a fruit cake, you probably wouldn't have guessed it, right? The sheer outlook of this cake is worth every single cent of that $78. Enough said. HAHA! 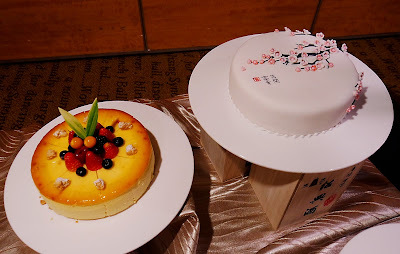 If you're not a big fan of fondant, like yours truly, you can easily peel the fondant layer away and just enjoy the fruit cake inside that has its cinnamon flavour going strong. 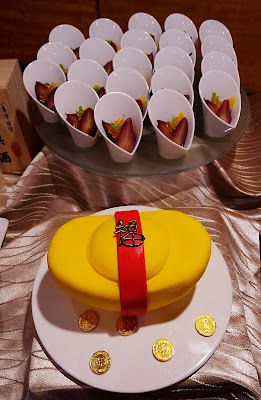 Seriously, this is not a cake. IT'S A PIECE OF ART. I'm not even exaggerating to say that my heart screamed "NOoooo" as the chef sliced through the cake right over the bunch of cherry blossoms. Also fondant covered, I find that the fondant layer for this sugee cake is much thinner and easier to eat as compared to that of the fruit cake. 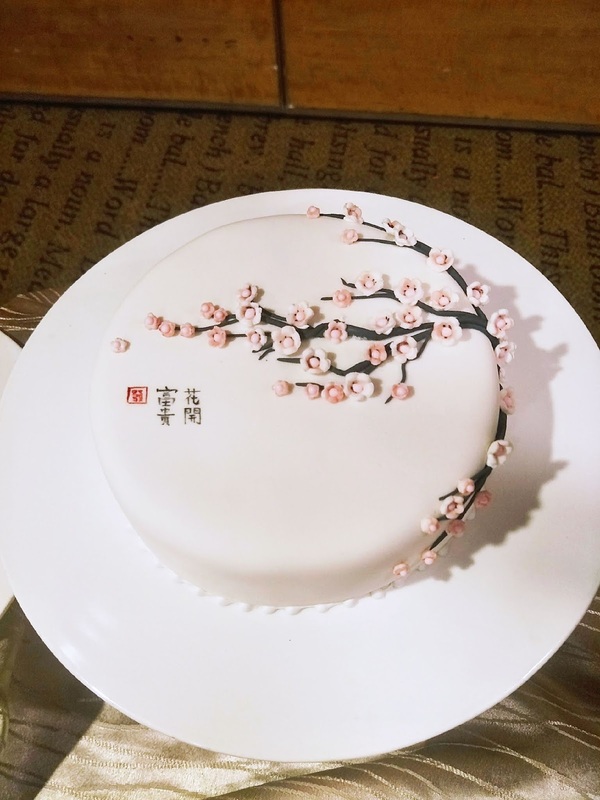 And also, as sugee cake itself is a very basic and mild-tasting cake, having a thin layer of sugar paste also helped to add more sweetness to the cake, which is literally the icing on top (no puns intended). 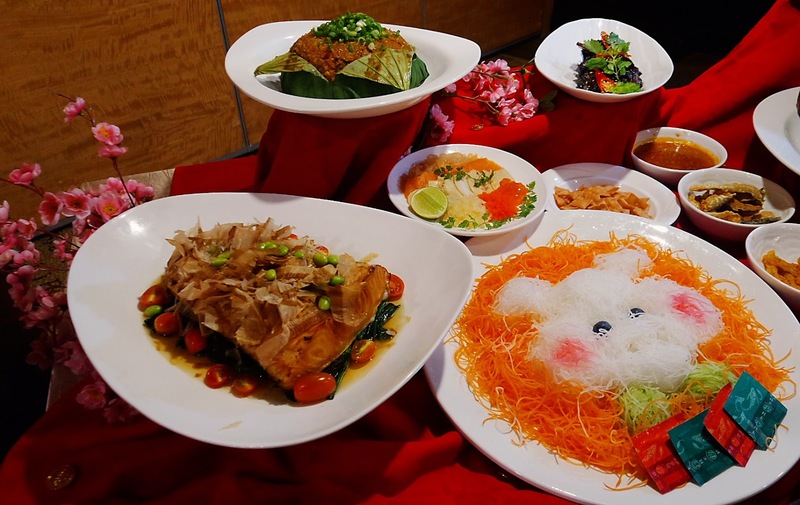 So, are you ready to roll for this year's CNY feasting with Amara Singapore?